Television! Who does not know about it? No matter how busy you have got with your lives, there was a time you watched television, enjoyed those cartoons and had fights with your siblings for the remote. Let us have a look at some of the questions related to television and their possible answers. Well, I used to watch but now I have altogether stopped watching it. Oh! I love watching television. It is something that helps me break off stress after a tiring day. I really don’t watch television, but when I used to, I loved watching romantic serials and the history channel. I love watching travel shows and discovery channel. Also, I like watching the old cartoon series. For some reasons, I think they were the best we could ever have. How many hours of television do you really watch? Per day, I would say I watch around an hour of television. This includes either watching a entire one episode of bbc travel or may be listening to some songs. Well, my country is divided in two parts for television. The elder generation and the younger ones.But then there are some enjoyed by all. Like Comedy nights with kapil, ballika vadhu, Code red. I like watching serials with some historical content in it, like ashoka samrat or the history channel. Also, I love watching Mtv and channel V shows. One of my favorite being girls on top. Television is a good time killer, I believe. It keeps people entertained and joined together. So, there are friends made who like the same show and then they talk about it, discuss the story line. It keeps people imagination opened up. Also, it is good way to be informed about the daily happenings of the world. Television, if seen more than necessary can make yo dumb. Because it is sort of hearing activity when you are not using more of your senses on reacting and the mind is not working. You are just watching whatever is going on. This can make the mind dull. Also, it affects your life, when people get stuck to it. Most people procrastinate on their work and exams because of it and I think that leads to lot of trouble. I think the last time I saw television was some months ago. I don’t know. These days with so much happening on internet, television too an extent has got a little outdated. I think yesterday was the last time I watched television. I was actually watching a show on the mysore history and it was quite fascinating to see it. I think the only reason that TV shows become so popular is because they are able to connect with the nerve of the individual. So, like I love watching girls on top because it is story of three girls trying to make big in a big city. This is a story of so many girls. So, they surely watch it and make the show popular. I am not really fond of television as such. So, you can find me seeing television very rarely. Like may be sometime in two months or when there is a cricket match. I like watching matches on television because the entire family comes together to watch it. Too an extent yes they are. But, I believe that with internet coming out and the play stations and other video games coming into market, television has surely got a little side. But, then when we are talking of those very little kids like below 12, I think certainly yes, they are addicted to television. I believe that watching television has benefited me in some way, as well as bringing me some detrimental consequences. Watching television program enabled me to broaden my vision because I came to know so much more about the world, but later on I got addicted to it. So, I had to wear glasses from a very early age. 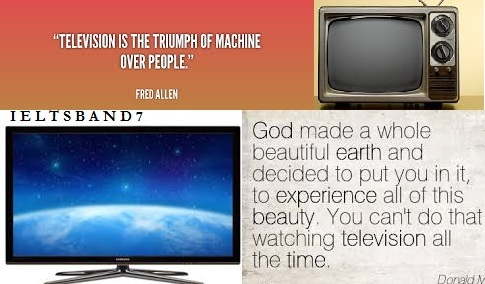 Yes, as the techniques have advanced in these years, the TV has also developed a lot. They have become thinner and clearer. Also, you can do internet, connect them with whatever device you have and do so much more. Earlier the screen was made with plasma panel making TV size way too big, but with LED and LCD coming in, there has been lot of improvement on size. I am preparing for speaking section .can u provide some pattern?